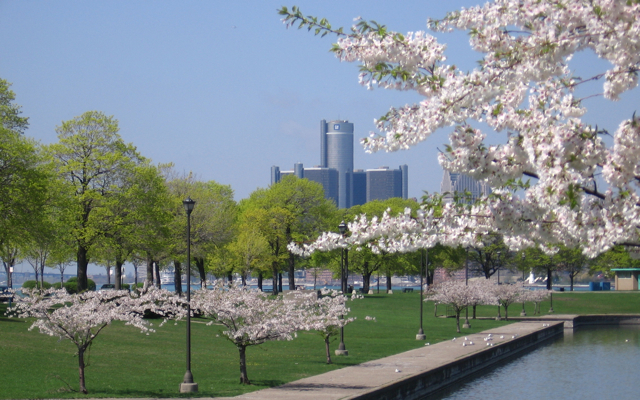 Belle Isle, an island park in the middle of the Detroit River. Belle Isle is an absolute oasis of peace and tranquility only a quick trip from the city. Sitting on the island and looking across the blue river at Detroit gives you a distinct sense of being detached and removed from the problems you had in the city. 100 Sakura Cherry Blossom trees in bloom. It’s one of the last things you’d expect to find in Detroit nowadays, and speaks to Detroit’s one time majesty, and automobile industry ties. 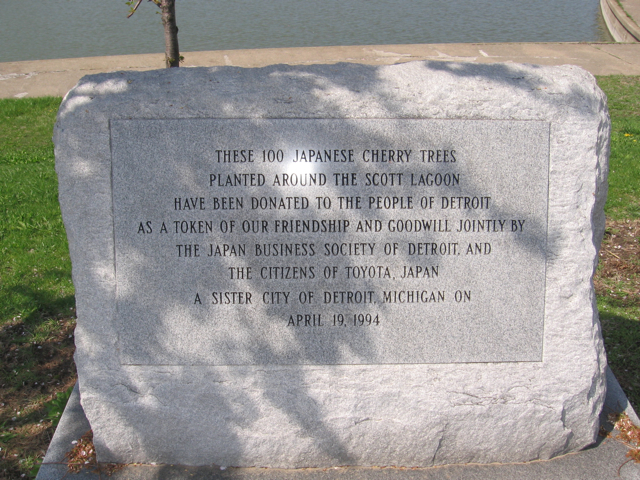 The trees were donated by the city of Toyota, Detroit’s Japanese sister-city in automobile production. A dedication posted near the Scott Memorial Fountain explains: “These 100 Japanese Cherry Trees planted around the Scott Lagoon have been donated to the people of Detroit as a token of our friendship and goodwill jointly by the Japan Business Society of Detroit, and the Citizens of Toyota, Japan, a sister city of Detroit, Michigan”. Most of the trees surround the artificial lake at the western most tip of Belle Isle, but I have seen more in other parts of the park, including near the entrance to the park on the Detroit side of the Belle Isle Bridge, and in the Japanese Garden which is on the west side of the Belle Isle Botanical Society’s Conservatory and Greenhouse. With Spring on the way, you might want to start watching the weather, monitoring the trees, buy up some sake, and plan yourselves a traditional Japanese-style Sakura-viewing Hanami party. 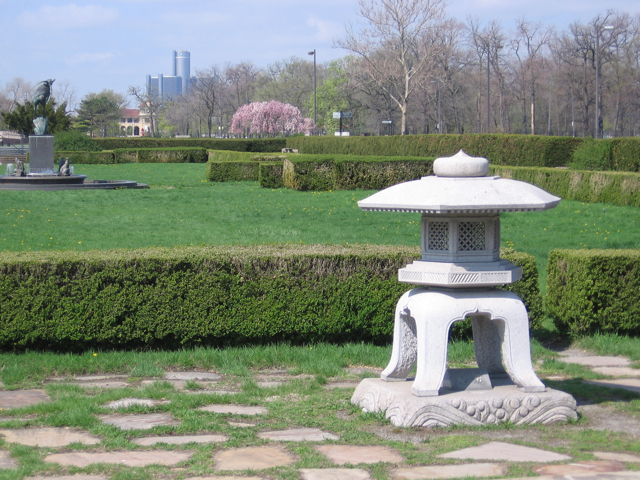 Sadly, hanami has been replaced by the Detroit Grand Prix and chain link fences prevent experiencing your views today. 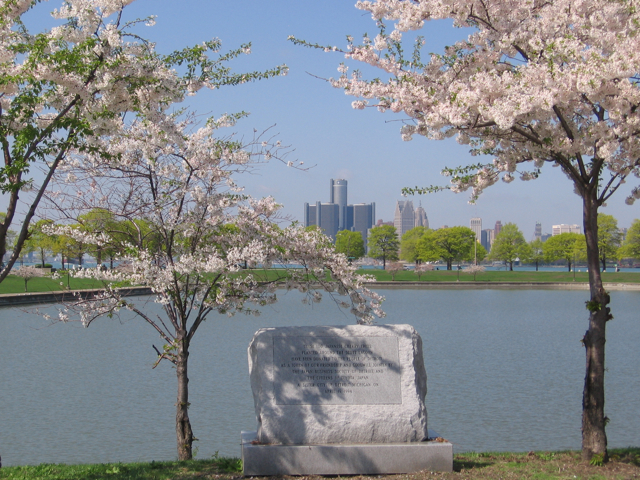 The Newsletter of the Belle Isle Conservancy compounds this insult to the gracious citizens of Toyota, Japan, by referring to the trees as a gift from the city of Tokyo. WHAT?!? Aww man. It was still possible to approach the trees through a few doorways in the fences near Scott Fountain for a while. I can’t believe they locked those up, though. Perhaps the Conservancy needs to be informed of its (hopefully) innocent mistake.